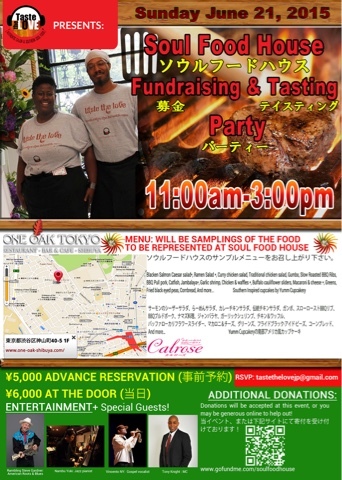 Go to http://gofundme.com/Soulfoodhouse to donate or contact us about investing. We at Taste the Love have enjoyed your support so far in our wonderful journey of food and family, catering, events and Thanksgiving Parties. We are now looking to open our 1st physical location and would love your financial support. Please have a read of our crowdfunding campaign. There are many great incentives and as the campaign continues we will be posting picture of the food we serve, video of the atmosphere we are trying to accomplish and more. Living overseas it's amazing to me how the image of American food has become hamburgers and hotdogs. My cooking students are always surprised with the plethora of dishes I teach, and I haven't even really begun to expose them to dishes outside the SOUL, CAJUN-CREOLE & Tex-Mex of the southern states. America has so much to offer to tables of food lovers that are simply delicious. Some are healthy, some are not, but they are all tastes that bring comfort to the soul. In the winter months, oysters are very popular in America, especially in Louisiana. To mark the start of Mardi Gras in Louisiana & in honor of keeping you warm during these cold months, today's recipe is Oyster stew. Not only is it tasty, it's simple to make. Be sure to use real butter though. It will make or break your recipe. In closing, while living in New Orleans, LA, I had the pleasure of sitting under Bishop Paul S. Morton. He is not only an great pastor, but amazing singer. I have so many favorites, but a few years ago I was in a low place in my relationship with God. I couldn't read my bible, pray or barely go to church, (And I still have my moments) But my heart still wanted to please God. This song became my prayer. Lord I'm in this funky place, but whatever you are doing, please don't do it without me. 1. In a large saute pan, melt the 4 tablespoons butter. Stir in the flour, stirring constantly and cook for 3 to 4 minutes. 2. Add the onions and celery and cook for 2 minutes. Stir in the milk and oyster liquid. 3. Season the mixture with salt, cayenne and black pepper. Bring the liquid up to a simmer. Simmer the liquid for 3 to 4 minutes. 4. Let it slightly cool then Put in a food processor and purée. 5. Return to the pot and Add the oysters, garlic and parsley. Bring the liquid back up to a simmer and cook for 3 to 4 minutes, or until the oysters curl. Stir in the remaining 2 tablespoons butter and remove from the heat.